When Mort Weintraub and Adam Loory came up with the idea for Expressly For Fun, they were looking for a way to rekindle interest in the sport of big boat racing. They figured the best way to get more people involved was to take some of the intenseness out of the racing and put more of an emphasis on the party and social interaction. 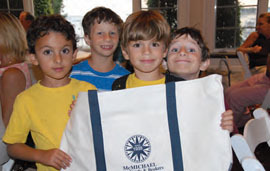 Huguenot Yacht Club, which always likes a good party, picked up the ball and has run with the event since 2001. For the last three years the club has added an extra twist to the event making it even more fun for all by having a charity auction to raise funds for junior sailing scholarships. As a result, more juniors have gotten involved in the regatta and in the sport. This year over $5,000 was raised thanks to some great auction items donated by Rives Potts of Brewer Pilots Point Marina. One of the prizes put up for bids was free winter storage, including hauling and launching, and the other was a day of racing on one of the Brewer Match 52 match racing boats. Along with these great items, bidding was fast and furious on wines made by Huguenot YC members with fun names and labels like Courage in a Squall, Regatta Red, Tug and Barge, andSoulmates Rollout Red. As usual, racing was as hotly contested as is possible in a port-to-port race with a pursuit start. On Saturday, Dave Newmark and Patricia Pardini sailing the 1952 42-foot steel ketch Outrageous, the slowest and therefore first boat to start, led wire-to-wire in the non spinnaker class for the second year in a row. Dave played the Connecticut shore to keep out of the current. In the spinnaker division the opposite happened. Adam Loory’s newSoulmates, a custom Roger Martin 40, which started last, passed all the spinnaker boats to take the win. Most of the fleet finished on the leading edge of a squall that never squarely hit the fleet. The whole fleet of 22 boats was taken care of by the Stamford Yacht Club. Since the race finished so early, instead of picking up a mooring, Martin Anidjar, sailing his brand new Tartan 4000 Starbreaker, decided to go to the beach at Todd’s Point, while the rest of the crews enjoyed refreshments and the pool at the SYC. As usual, dinner at Stamford Yacht Club was plentiful and delicious. After dinner, auctioneer Bob Hulbert, a Past Commodore of Huguenot YC, did a masterful job of punching up the bids quickly with his fast tongue and quick sense of humor. Anyone caught by his gaze while scratching their ear, nose or hair was assigned a bid. Hulbert even landed a $40 bid on a protest flag, claiming it was guaranteed never to lose a protest. Stamford Yacht Club Past Commodore Hiro Nakajama enjoyed the dinner and auction and said that he hoped his own club could reproduce such a fun evening that would benefit a good cause like junior sailing. On Sunday after breakfast aboard or at the SYC’s snack bar, the fleet gathered for the race back to Can One just northeast of Execution Rocks. With no wind at noon, the course was shortened and the fleet motored to the new starting mark off Greenwich Harbor. A very faint southwesterly gave the fleet a one-tack beat to the finish. The battles for first in both the spinnaker and non-spinnaker divisions were close with both winners grabbing gold right in front of the finish line. Larry and Lynn Rouen’s just refurbished Dawn 41 Nepenthe over took Bill Scherer’s Swan 36 Petra and then Len DiIorio’s O’Day 39 Impulse, which was second and Petra ended up third. In spinnaker division, once again Soulmates prevailed, but only after catching and passing the Soverel 33 Deviationwithin 50 yards of the finish line. Deviation’s race was especially impressive since the whole crew was made up by Huguenot YC juniors. Watch for this team in the Beach Point Overnight Race for juniors later this summer. The crew of Deviation: left to right: Matt Taylor, Ray Vogel, John Giantelli, Iris Vogel, Haley Horn, Lauren Giantelli, Sophia Rogers, Tim Rogers, Catherine Andrew Rogers.